145 Commercial Real Estate & Properties in Brendale are listed in 7 categories. We have 86 Industrial Warehouses Lease , 45 OfficesLease , 6 Retail ShopsLease , 5 Other Commercial PropertiesLease , 3 Development LandsLease and 2 Medical and Consulting PropertiesLease . 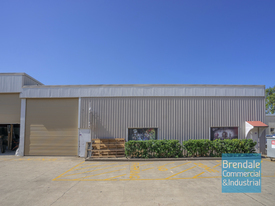 Set amongst some of Brendale's most established businesses is this functional and neat warehouse with office. Enjoy the versatility of the location at a fraction of the price. 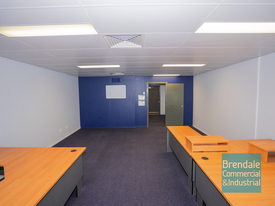 Toilets within the property Full office plus reception space Total 150sqm Lunch bar with the complex Wide access Mezzanine Storage Contact Brocke to arrange an inspection today. 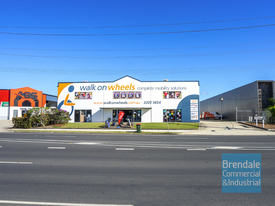 Ray White Commercial Northern Corridor Group is please to offer for lease 9B Leonard Crescent, Brendale. 49m2 office 654m2 Workshop/Warehouse Secured fenced hardstand Onsite parking Easy transport access Highly visible corner location For further information or to arrange an inspection contact the agent listed. 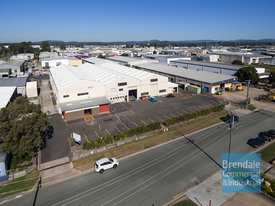 Ray White Commercial Northern Corridor Group is please to offer for lease 2,22 Belconnen Crescent Brendale. Features: 145.5 m2 Zoned GI 8 m2 office Own internal amenities Security fenced and gated 3 phase power For further information or to make an inspection please contact Trevor Nelson Jones. This prolific stand alone warehouse comprises of 140sqm executive office space, plus an additional 1110sqm of heighted warehouse space. All this with ample access from within the property right out to the Bruce and Pacific Highways 2000sqm of Land 5.9m 6.5m Height Three roller doors, two at the front, one at the rear Three Phase Power Fully fenced with easement 15+ car spaces Three toilet, inc disability access Ample kitchenette facilities For further information or to arrange an inspection, please contact the Agents listed. Ray White Commercial Northern Corridor Group as exclusive leasing agents are pleased to offer to the market 276 Leitchs Road Brendale. If you are looking for fully fenced industrial land for hardstand with great exposure this property is for you. Property features include: bull; Fully Fenced Secure Hardstand; bull; Corner block with great exposure to Leitchs Road; bull; Two street access through secure electric gates; bull; Various Sizes Ranging From 1000 m² Up To 3,893 m²; bull; Water Electricity available; bull; Road base hardstand; For more information please contact Peter Laurent Trevor Nelson Jones from Ray White Commercial. Unit 32 offers optimal layout flexibility including 4 partitioned offices and a lunchroom, a showroom and storage via an electric roller door. 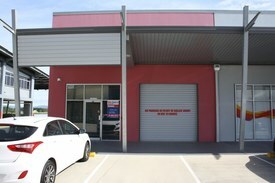 Comprising the corner ground floor office, this commercial unit provides for excellent natural light. Property particulars: Corner unit with excellent natural light on both sides Open storage facilities Suspended ceilings throughout Floor coverings Four fully air conditioned partitioned offices Allocated car parking directly outside tenancy Ample visitor parking on site Immaculate presentation Rental by negotiation, open to reasonable offers. For full particulars and to inspect, please contact the exclusive agent David Bright. 850m2 Fenced Hardstand Yard $16,200 PA + Outgoings + ..
179m2 Classic Industrial Or Storage Unit $18,000 PA + Outgoings + .. Highly Exposed Drive Thru Retail Contact Agent For Latest ..
170m2 Industrial Unit With Office $18,660 PA + Outgoings + ..
197m2 Classic Industrial Or Storage Unit $19,700 PA + Outgoings + ..
1,000 Sqm Kremzow Road Warehouse For Lease $115 per sqm + Outgoings ..
Ray White Commercial is pleased to offer to the market for lease Unit 1 at 75 Kremzow Road, Brendale. 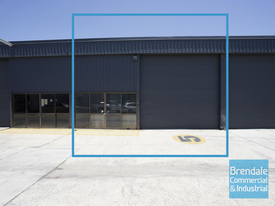 The property is a highly functional warehouse with fully fitted out office in a prominent Brendale location and will not last long. 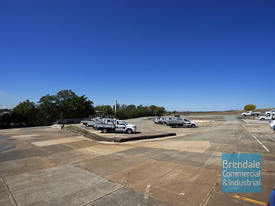 This property provides a fantastic opportunity for a business to relocate and is available from the 1st of February 2019 Property features include: bull; 1,075 m2 building area; bull; 1,000 m2 warehouse; bull; 75 m2 modern office with clean carpet, air conditioning, Cat 5 cabling and kitchenette; bull; 120 m2 of secure hardstand; bull; 10 Exclusive Use Car Parks bull; Clear Storage Height from 5.8m to 6.5m (underside of rafter) and 6.4m (underside of beam) bull; Two Electric operated Roller Doors, 6.0m wide by 4.8m high and 5m wide by 4.8m high bull; Two chain operated Roller Doors, 4.0m wide by 4.8m high bull; Male, female and disable toilet facilities bull; Show facilities bull; Semi Trailer access bull; Kitchenette facilities in office and warehouse For more information or to arrange and inspection, please contact agent Peter Laurent. Quality Brendale Office Opportunity $5,000 per month (outs in..
350m2 Industrial Unit With Office $38,500 PA + Outgoings + ..
168m2 Industrial Unit $16,800 PA + Outgoings + ..